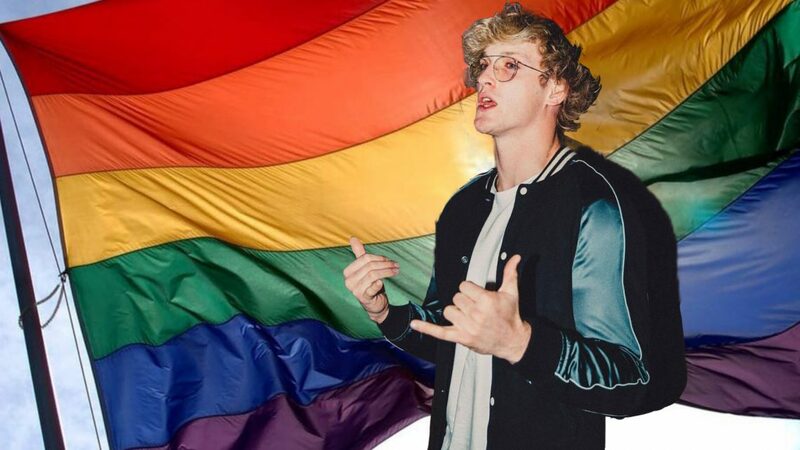 Popular youtuber and vlogger Logan Paul is once again facing negative press and criticism after jokingly declaring “it’s Male-Only March” which he meant becoming gay for only a month as he mentioned during the most recent episode of his podcast “Impaulsive”. While he and his co-hosts laughed among themselves with Paul’s resolution, viewers, listeners, and the rest of the public were not thrilled at the 23 year old’s declaration and have expressed their displeasure at him. Logan Paul is no stranger to controversy. During 2018, he vlogged his trip in Japan’s infamous Suicide Forest where he and his friends filmed an alleged suicide victim and laughed around the body. The Original Vlog has been deleted but users have reuploaded the video minus the footage of the actual body to keep up with community guidelines. Logan Paul’s actions have landed highly negative reactions towards him due to him not only filming the body and laughing around the body but in his original youtube thumbnail, he included the person’s body in the thumbnail picture. This controversy led to Logan Paul issuing an apology which was still highly criticised as well as Youtube itself enforcing even stricter rules and guidelines about channel and content monetization among other ramifications on the video sharing platform. Since this controversy, he has made many declarations regarding how he should improve on himself and his content. “I know I’ve made mistakes. I know I’ve let people down. But what happens when you’re given an opportunity to help make a difference in the world? It’s time to learn from the past as I get better and grow as a human being. I’m here to have a hard conversation as those who are suffering can have easier ones. In Logan Paul’s Impaulsive Wednesday podcast episode, he declared that he will attempt to become gay for a month as part of his new year’s resolutions which he and his co-hosts laughed about for a moment before moving towards a different topic. Logan Paul’s declaration of “Male-Only March” was not talked much during the podcast nor was it elaborated on how he will deal with becoming gay. As seen in the podcast footage, it was only mentioned, talked about for a few seconds, then they quickly laughed it off and moved on to different topics. 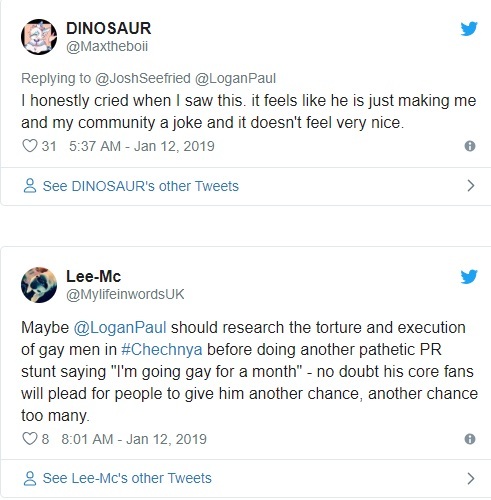 However, some viewers were not pleased with Logan Paul’s declaration and some twitter users resorted in expressing their displeasure at the vlogger. There are also comments coming from twitter about the entire situation. Since the backlash, Logan Paul has made a short apology via his twitter and proposes that he talk about this controversy on his next podcast. 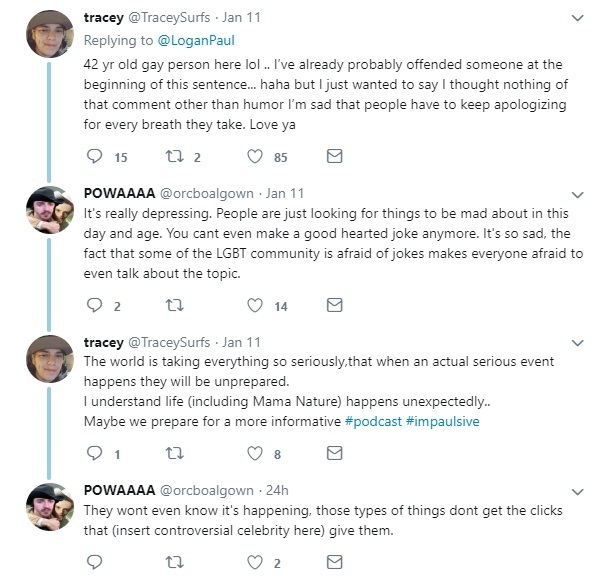 Many people in his tweet have responded negatively to his apology, saying that his apology was not organic, and many more accusing him of making money of the mistake he made by turning the backlash against him as a topic of conversation in his next podcast. It has been reported that he will not go through with his “Men-Only March” resolution after the backlash he has received. Given what this situation has provided, there seems to be a bubble or a certain chip on everyone’s shoulders that people may wonder. 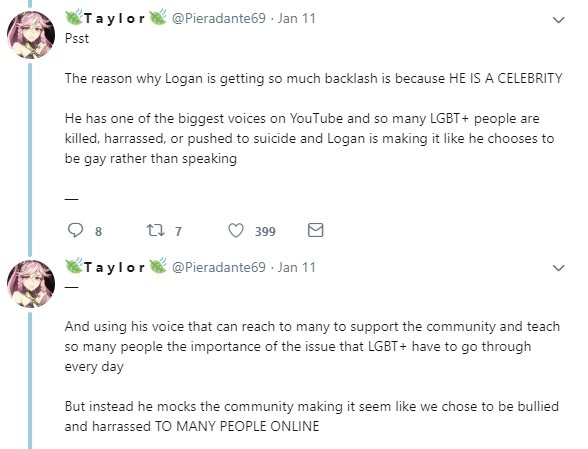 Was the LGBTQ community right when issuing their offended remarks to Logan Paul, while further spreading more information about the negative experiences the community suffers, or are they just offended for the sake of being offended? Is it really worth everyone’s time to read about a short statement made by Logan Paul and give him even more attention? Or is everyone really just wasting their time being offended at something just because “Logan Paul said it”? Is being gay really a choice or a phase that some people go through? Many more questions like these will pop out the more people talk about this conversation. The next question really is, what is everyone going to do about it?